Fruitcake Manchester City striker Mario Balotelli has increased the controversy around his troubled first season in England by holding an impromptu press conference at Eastlands and seemingly being possessed by batshit-insane actor Charlie Sheen. Inside the Sheepskin understands that Balotelli has moved in with three women – a page three girl from Liverpool, a female professional wrestler only known as “Miss Destructo” and a midget. They apparently sleep together in a jacuzzi filled with blancmange. When asked about his plans for the rest of the season, Balotelli merely said the word “winning” 43 times before urinating onto a Manchester City shirt that he had lit ablaze. 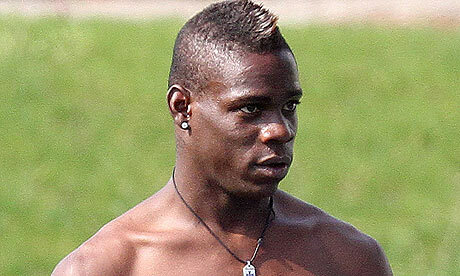 Roberto Mancini has dismissed Balotelli’s behaviour as “him just settling in”.